BBS Window Blinds are a supplier of quality residential and commercial window blinds and solar control products in Manchester and across the Northwest. Our dedicated staff and product knowledge help us advise our clients on the best possible products to cater to their needs. As well as our great quality and value residential blinds BBS Window Blinds are also a commercial blinds specialist who specialise in supplying high quality commercial blinds to schools,offices and industrial units. All of our sales and fitting team have been trained to provide the highest levels of knowledge to help you pick the right blinds for your home or work space. We’ll come to you in the comfort of your own home or office so you can see samples in the room where they are going to be fitted and so that one of our trained fitters can make sure that the measurements are done correctly for a perfect fit. Whether you’re redecorating your bedroom and are looking for a modern and contemporary finish or refurbishing a school or office block and require contract anti-glare fabric to ease solar gain, we’ve got blinds to suit everyone. Please see further details on the relevant links on this site or contact the office now on 0161 244 9467. Mr J, Swinton – A quality service provided from start to finish. The range of products that BBS have to offer is out of this world. I would have no hesitation in using the guys again. BBS offer a fantastic service. 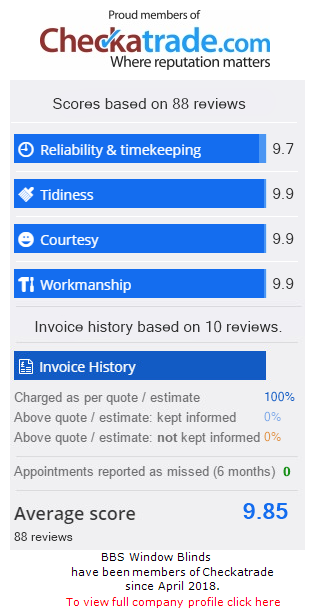 We used them to fit out blinds throughout out house and not only was it a quality installation thye guys were friendly and helpful on how to use and care for our new blinds.